"Split, crop, merge, watermarks, secure, etc. your PDF files in a single blow"
PDF Shaping up is an ingenious software that allow you to do many features in one single software. For instance, you can do the management of a layout like resizing and croping, deskewing, rotating, batch treatments and more. This PDF editor is convenient for your work and homework. 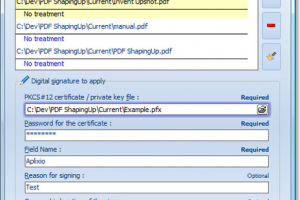 Also with its document encryption and owner permissions, PDF shapingUp will give you the security that you need for your projects. Nevertheless, the fact that this software displays high quality and resizable image thumbnail makes it perfect for fast sharing over your network and email usage. The vast variability of tools that will be accompanying you along your paper work or homework in a single software, makes PDF shaping up inexpensive to the user since doesn’t have to buy one tool at the time. All in one! The ingenious PDF shapingUp, will help you edit your PDF files in single interface, and it doesn’t require the installation of the Adobe Acrobat products.